My grandmother was Gertrude Calvert and she lived at Illingworth House with four siblings and her parents Hannah (n. Aspinall) and Leonard Calvert. 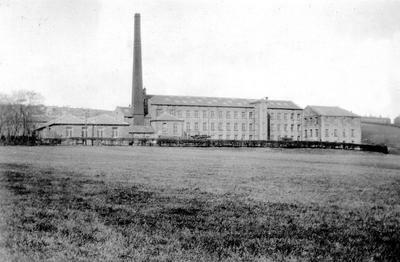 The family owned the large spinning mill standing on the present site of the Morrisons supermarket. My great aunt Elsie lived in the old house until she was 100 and the house was demolished for the car park soon after her death. The Calverts had wool in their blood, starting generations earlier at Luddenden Foot with a water powered mill and then building new mills at Wainstalls under the names of J. and J. Calvert. 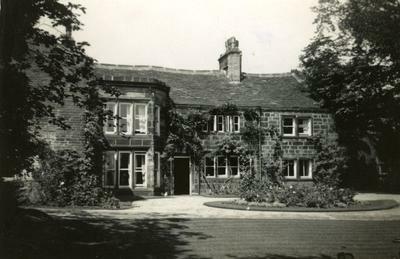 Jonathan Calvert lived at Moorfield House until the move to a new mill at Illingworth. The family had known the Bronte's quite well. But then, everyone knew everybody for miles around. They were all musical. My great aunt Mary had a lovely singing voice which was much admired and recorded in London but she chose a very quiet married life. Edward and Gertrude were both very talented pianists. (In fact their parent Calvert's formed a small orchestra of family and friends). 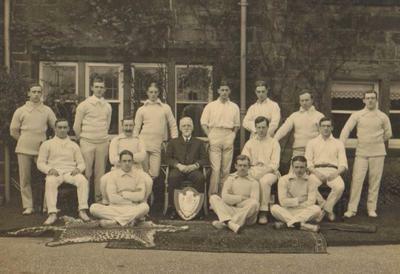 The family also founded the Illingworth Cricket team (note the displayed Leopard skin)- I wonder where they found a level pitch? The household kept a few cows and employed a cowman who my mother adored when she was a little child. He later doubled as a chauffeur for Edward Calvert's Vulcan car. The Mill gradually declined in the 1960's. I remember wandering around seeing machines running under thrashing belts and the whole great stone building rocking gently in time with the steam engine. Many local women skillfully operated the huge spinning machines and hurried about on worn, oily floor boards... But the winding shed was not fully in use. The rush of white exhaust steam billowed over the big mill dam at the end of the long day. The old engine was lovingly nursed along by Tom Tillotson who lived just down the road. Yorkshire TV recorded the mill's dying days and despite efforts to interest the Science Museum the scrap men broke up the engine...the heart was gone. The last working steam powered mill had died. It had been running at a loss for years and fed by sentiment, not profit. But in my youth I was steeped in family stories and hilarious tales of Halifax life. Nothing later ever matched the warmth, laughter and music in Illingworth House. No doubt there were hard times for many less lucky but mostly everyone had spirit and proudly belonged to Halifax. I wonder if late night cleaners in Morrisons see or hear any ghosts? Thank you for your post here Christina. Yes my great great grandmother was Mary Silverwood. I did the Calvert history research a few years ago and will have to dig out the old folders. There is an ancient photograph of William but forgotten if Mary is there. However a Calvert relation has a bigger collection of old photos/portraits so will ask. Interesting information on your Calvert family, Susan Clark. I've just worked out we are probably 6th cousins! Gertrude was the granddaughter of William Calvert and Mary Silverwood. I have been doing ongoing research on the Silverwood family tree for 18 years. My Mum was a Silverwood. My husband and I moved from Norwich to Scotland 4 years ago! Hello Christopher. Nice to hear from you. Yes, I didn't meet Jonathan but the two children I think. I still have a recording of Elsie Calvert talking with them at the 100th party. I first visited Illingworth in 1943...but don't remember much - aged 6 months! I remember Tommy Tillotson very clearly (and have many photos of him and "Matilda") . I must get around to sending them to the museum for safe keeping. My family always took lots of photos and it's time to get all on to DVD's as they are already in a digital 'Calvert' file. I'll post copies to Robert for redirection. A few more comments to add to the Calverts Mill Story. My Grandmother and Grandfather were Elsie and Edward Calvert, who lived at Illingworth House. My mother was Ruth Lemon their daughter. I am Chris Ruth’s son, brother of Jon. Like Jon I too live in Australia. After I left the RAF in 1957 I worked for my Grandfather at Calvert"s mill for 5 years while living at Illingworth House. During this time sadly it became evident that the wool textile industry in the UK was in decline but it was certainly a very enjoyable and interesting part of my life. So many of the people who worked in the mill had never worked anywhere else. A good example was Harry Keighley who startling working there as a 12 year old and was aged 78 when the mill closed in 1970. Tom Tillotson, always known as’Tommy’’, had been there for upward of 50 years and it must have been a very sad day for him when he shut down the large steam engine, named Matilda, for the very last time. I think there has been a few memory lapses because Jon did not attend Elsie’s 100 birthday celebration at Illingworth House. Jon’s youngest son, Nigel, and my oldest son,Nicholas, both aged 12, flew from Australia for the celebration on their own. It was a huge adventure for them to represent the Australian part of the family. Thanks for writing. Yes indeed I last met Jon at Elsie Calvert's 100th birthday party at Illingworth house. He was older than me but I was closer to his mother Ruth (ne Calvert) who I met and stayed with on several occasions. She was a fine example of the tough Halifax breed! In fact a huge influence on me. I still keep in touch with Jon's brother Robert and sister Angela who are both thriving in their northern habitat..we are all getting old. My friend Jon Lemon was a grandson of the Calverts and at one time lived with them at Illingworth House after he finished his time in the Royal Navy. After an accident involving the engineman (Tom Tillotson?) Jon was asked to tend the machinery for a short while and still remembers those days although he is now living in a care home here in Tasmania, Australia. From the writing by Susan Clark it seems that she must be some relation to Jon. I wonder if she ever met with him at Illingworth House ? Join in and write your own page! It's easy to do. How? Simply click here to return to Illingworth.